How do I unbookmark a question bank in a course? You can easily removed bookmarked Question Banks. Verify the Question Bank is no longer bookmarked. Previous Topic:How do I bookmark a question bank in a course? Next Topic:How do I delete a question bank in a course? 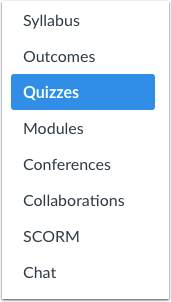 Table of Contents > Quizzes > How do I unbookmark a question bank in a course? Re: How do you get Canvas to only show question banks from the course you are in?